If you are a regular rider and have come to Nepal for some trekking or other adventure, then make some time to join one of these day trips, you will not regret it. 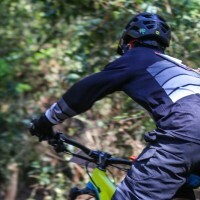 A mix of off-road trails and the best single track sections on offer in the Valley north. 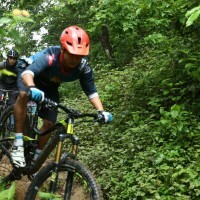 Zig-zag your way through the rice paddies and semi rural villages and test your skill on some fine sections of single track. 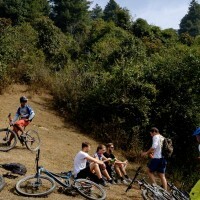 The ride combines sharp, steep climbs, sweet down hills and single tracks. There are many variations on this route depending on where your guide takes you and your fitness and skill. The ride kicks off with a short section of traffic roads to the National Park Gate. Enter the jungle and follow the winding jeep trail on its 21 km climb to the top of the second highest ‘hill’ in the Valley. Views are great from the top, take time to rest and explore the small monastery and have a packed lunch. Now the downhill begins, retrace the main trail for 3 km then head right, deeper into the jungle, from the army check post there are great views of Manasulu and Ganesh Himal. From here the single track fun begins with a fast descent, the trail at times can be overgrown with jungle vines, all the more fun. After the single track, 6km of sweeping flat trail takes us out of the jungle and back to the main road at Mudkhu for a tea stop. 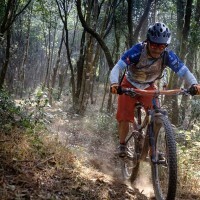 From Mudkhu follow cross country trails and fun single tracks before returning to Kathmandu. 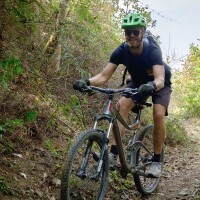 One of the most challenging rides in the valley that rewards you with fantastic mountain views on a clear day and around 9 km of single track riding in the dense jungle. The ride starts with a long on road climb of around 27 km to Kakani (you also have the option of going on the bus or in a jeep). The last 5 km of this climb are quite steep. Stop for rest and lunch in this tiny village and admire the Himalayan views. From here we enter the park and have a short but tough climb that may involve some push and carry. Things get exciting as we enter the jungle and the track narrows. Technical riding abounds for the next hour or so. Emerge from the jungle and drop almost vertical back down into the Kathmandu Valley. A truly great ride. Leaving our Shop, the ride heads northwards following the main road for around 8 km on a steady climb to Bhudanilkhanta. From here, ride up hill for another 8km on a smooth switch back road which climbs through the jungles of Shivapuri National Park. Past the army college the road flattens and you can get great views of both the valley and the Himalaya. The next section we call ‘30 min of heaven’, a sweeping single track in the Jungle with great turns and descents. Re-join the jeep track and climb for a further 3 km before the trail again begins to descend, turn off the main trail for a steep and super technical descent through the villages and the ‘Heli Pad’ … if you can ride it all! Take a late lunch in Bouldanath to fill up empty tummies before returning to Thamel. 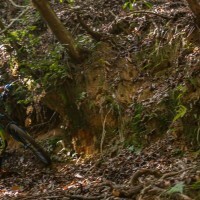 Our selection of Intermediate Day Tours covers some big climbs and descents, single track and some technical sections. Route can be changed on the fly, so don’t be scared to try something, if its to hard we will bring you back on an easier route. Hire bikes and a helmet are included in the price of our day trip’s as well as the guide, first aid kit, spare parts and tools. Hotel picks and shuttle can be provided on demand, ask us for a quotation. 24 hour advanced booking is required, send us an email at info@himalayansingletrack.com or talk to us +977 01 4700909.